Some days, it seems like being a parent is just climbing one long, steep learning curve. There are more things to learn about parenting than there have been for any other job I’ve ever had. With every other job I eventually reached a plateau where I felt competent in my work when I came in each morning. I occasionally had to react to a curve ball or two, but generally felt on top of things most of the time. 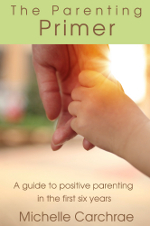 Parenting is a job that is changing all the time, and just when I think I’m getting the hang of this thing, one or both kids grow and change and enter into a new stage of development. 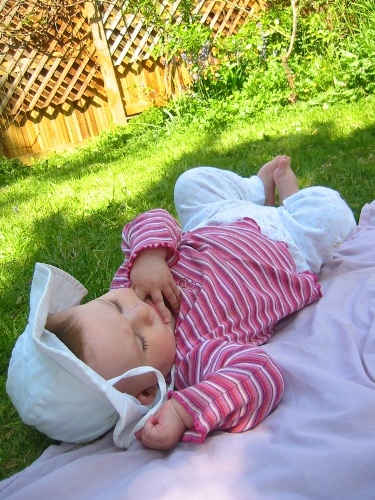 10 month old Beatrice relaxes in the garden. I've learned a lot since then! Some things I’ve learned directly from my kids, other things I’ve learned as a result of wanting to provide the best care I can for them. Between these two reasons and modes of learning, I feel like I’m learning all day long some days. I’m more of an autodidact than ever before, and that suits me just fine. the location of every publicly accessible bathroom within a 20 minute walk of my house. a wide variety of facts about hedgehogs, including their diet (omnivore that primarily eats insects! ), history (ancient mammal that was probably around during the time of the dinosaurs! ), behaviour (they will annoint themselves with their saliva after eating something particularly smelly, like rotting fish! ), and that they make little unhappy grunting noises when you wake them up during the day. how to write about my experience and make some money doing it. Before I became a parent I knew I wanted to be a writer but didn’t know what I wanted to write about. Now I have more than enough material to write all day long, but far less time available. While it can be frustrating and humbling to constantly feel like I’m learning new things on the job, it’s also fertile ground to be walking. Not only do I get to watch my kids discover the world, I have the chance to learn and grow alongside them. This year I’m looking forward to doing more focused work on self-discipline and playfulness in myself, so I hope I can get some inspiration from my kids. Cause in my house, the kids are the experts on play, and I’m pretty sure they can teach me a thing or two about that. Hahahaha; great post; some of the things you’ve learned were so entertaining and I know ALL parents can relate. I did love this line though “just when I think I’m getting the hang of this thing, one or both kids grow and change and enter into a new stage of development.” That is so true – as mum to a 9 year old I’m constantly amazed at the developments and changes we go through together. “Just how little sleep I really need to function”: yes! It’s shocking, isn’t it? “Now I have more than enough material to write all day long, but far less time available”: alas, isn’t it so? “How to be productive in a short amount of time instead of spending the bulk of my free time procrastinating”: I’m working on this one. And hedgehogs! I love it! As for me, I’ve learned more about TRUCKS than I ever expected to know, and I expect to be learning more! I love your comparison to a job. I’ve always taken pregnancy and motherhood seriously – like it was my job, researching and learning as much as I can to make sure I do the best job that I can for the boss (the baby). Like you said, it’s not about me anymore! Love this. You have really nailed it with your analogy to the learning curve of a job – with almost any job, you get to a plateau point, not so with parenting (at least not at the point I’ve reached anyway!). It must be why parents feel such continuous stress – there’s so rarely a break in the mental gymnastics! how to keep a reasonably tidy house, huh? do you offer lessons? even sadder: i only have one kid! but seriously, folks… i’m eager to read your writings on play. one of my biggest fears before having my son was that i’d be no fun, which is turning out to not totally be the case, but i definitely think i’m lacking some natural fun-having gene. as per usual with your awesome blog, i imagine you’ll have some things to teach me! ha! reasonably tidy is a very flexible kind of classification! I aim for what feels reasonable to me – many of my friends have houses that are far cleaner, but that’s ok. I aim for a functional kind of tidy, in which I can mostly find what I’m looking for, have clean clothes to put on and clean dishes to eat off of. The rest gets done when it gets done! It’s true that parenthood isn’t a boring job, given how quickly the day-to-day tasks can change completely. I love these lessons: “just how little sleep I really need to function; just how much better I feel when I get a full night’s sleep” After two-and-a-half years, I still haven’t had more than a four or rare five-hour stretch at time but I am still standing! Great post! I can’t believe how many things I learned as a parent … from learning more than I could have imagined about vehicles (from my vehicle-obsessed son) to getting to review all sorts of educational concepts through homeschooling to learning about martial arts by taking karate lessons with my daughter! And that doesn’t count all the parenting information I studied. What a fun adventure parenting is! So true that as parents we are always learning new things! You are right…it is unlike any job. Love your list of things you have learned. I can relate to so many of them!